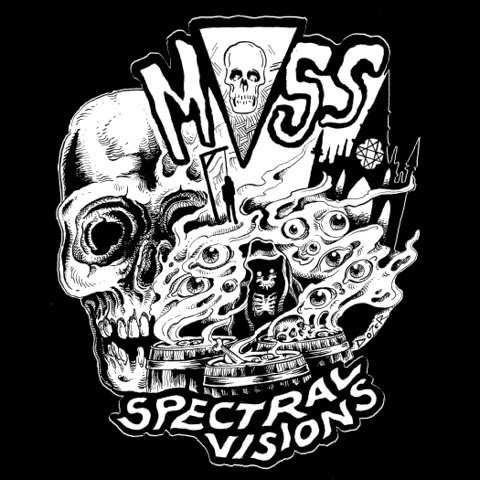 Since they emerged from Hampshire's catacombs in late 2000, MOSS have tirelessly dragged intimidating amplification and metaphysical malignance down a murky and overgrown path to oblivion. Whilst their sound has morphed slowly from lengthy and devastating exorcisms of psychic horror to a comparatively traditional form of sermonising, the last decade and a half has only seen them draw closer to a motherlode of ceremonial ambience and otherworldly dread. Fuelled by classic doom metal and British horror yet in thrall to no-one but their own wayward co-ordinates, these three seers have created a formidable collection of audial documents that bear testimony to an unflinching fascination with the ghastly and esoteric. However, Hallowe'en 2014 sees the triuvirate encroaching on territory anew. Having released an album on Aurora Borealis and two more on Rise Above alongside untold EPs, live recordings and split releases, they now embark on their first release for their own imprint, Stone Tapes, having chosen not to renew their association with Rise Above after the release of 2013's 'Horrible Night'. A 10” double A-side EP limited to 500 copies, it sees the band in splendid isolation, expanding on the gruesome Grand Guignol atmosphere of their last opus in suitably monomaniacal fashion, and deploying grimly earthen guitar tone, death-knell battery and stentorian oratory to conjure otherworldly malice from beyond with deadly fortitude. Preparing for a Halloween release, Moss continue their ever-more melodic ascent from beneath the grave into classic doom territory with their new 10" record. The vocals continue their veering away from the earlier more extreme moments, resting in a slightly-musical spoken/sung tone that, in truth, is the one thing separating this from being an exceptional pair of tracks. Without any great range, and without the sub-tonal rasp of the past, they mostly fall a little flat for me. Thankfully that guitar and bass sound is MASSIVE and at times fully redeems vocal shortcomings. Both tracks fit the familiar Moss pattern of intensely dragging, glacial riffs that slow the breathing, that pull you down into the plodding stomp. Spaced out, drug-fueled funerealism, steeped in an occult swamp that holds you in like quicksand. I found myself being constantly reattached to the tune despite the vocals. 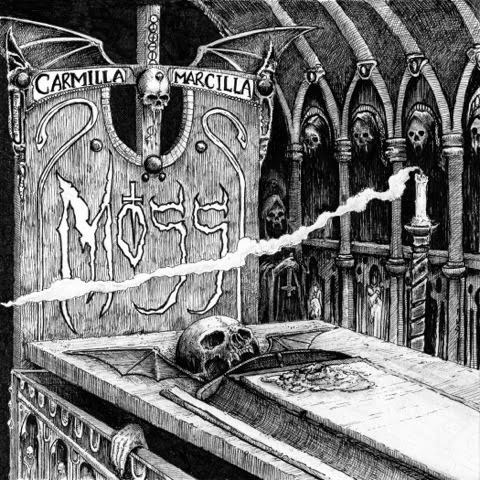 Side 1, entitled Carmilla/Marcilla is like a more direct funeral doom. Despite slowly drawn-out lyrics of being forever dead it holds an active, vampiric edge. It certainly isn't complaining about the death or doing the dying, dig? Unlike so much slouching downtrodden doom, this gives a better account to an almost predatory feel. Neither song is too complex or overtly sinister sounding, but they make great work of simple amplifier-worshipping relentless grooves that provide the pressure, the motive for the words. The back side, Spectral Visions doesn't dissapoint on that note as it immediately begins with a looping gutturally hypnotic riff that opens up after a few minutes into a droning slowdown. A lead break around 5 minutes or so tries to claw your eyes out with its scraping shrieking dissonance as Olly Pearson yells "can you feel it taking over your mind?" The weight pushes you down, and the wait closes in on you. Being a huge fan of their first three albums, I can't avoid disappointment in the loss of the extreme vocals but they grew on me after a few listens, and the music stands up well enough. I think quite a few fans of traditional doom could probably use this as an entry point for the subterranean end of the genre, being significantly more accessible than Sub Templum and Chthonic Rites, while still remaining extremely heavy and slow. You can stream and preorder Carmilla (Marcilla) from here.